« Does Baking Soda Really Whiten Teeth? As time goes on, things change. Your smile is no different. 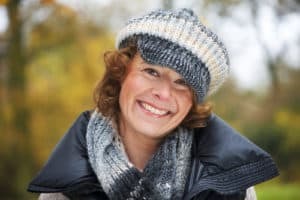 Lifestyle factors like drinking red wine, smoking, or grinding your teeth can all have an affect on your grin and can add years to your appearance. Even old dental work can cause you to look older than you really are. At my dental office in Chicago, we hear these concerns from patients often, and we’re always happy to help provide solutions to boost both confidence and health. Gum recession can be caused by a number of things like brushing too hard, grinding your teeth, or gum disease. When gums recede, more of the teeth show and they appear longer. Unfortunately, we subconsciously assume those with longer teeth are older. This is where we got the phrase ‘long in the tooth.’ There are various options available to treat gum recession and reduce how much of the teeth are visible. Talk with your Chicago dentist to determine which is right for you. No matter what your concerns may be, my Chicago dental office is here to help. We’ll work with you to identify your the best treatment to get you a smile that’s healthy and beautiful. Call us to schedule an appointment today.